Dania Beach Florida is a little paradise sandwiched between Miami and Ft. Lauderdale and offers a welcome respite from the hustle and bustle of these two more frequented beaches. 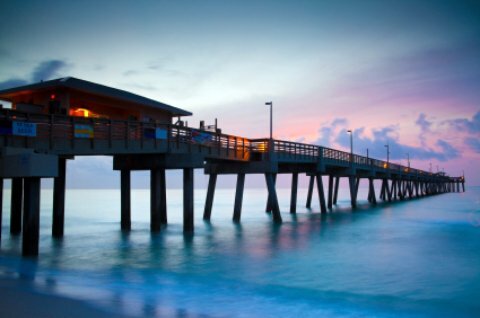 Dania Florida's famous fishing pier at dusk. Dania Beach keeps this huge fishing pier open all the time so those with insomnia can come here to enjoy fishing in quiet solitude 24/7. Everyone should walk the entire distance of this pier. It is really fun to walk over the ocean and enjoy the sights, sounds and smells of the area. Everyone, even well-skilled 'fishers', come from far and near to enjoy a few days fishing off Dania's famous fishing pier. A visit to Dania Beach wouldn't be complete without checking out the world’s fastest ball sport known as Jai-Alai, played here at “The Palace". Jai-Alai is similar to racquetball or handball but taken to the extreme and dubbed 'the game of a thousand thrills'. Enjoy the athleticism and sportsmanship as the players sling the game ball back and forth at speeds over 170 miles per hour. Visit the International Game Fish Association (IGFA) Hall of Fame & Museum explore the world of sport fishing. You can see exhibits related to sport fishing and participate in interactive displays of virtual reality fishing and enjoy seeing some record-breaking fish hanging from the ceiling above you. Experience the beauty of a well preserved undeveloped beach at John Lloyd Beach State Park where you can visit their nature reserve or walk along one of their nature trails for an environmentally friendly activity. Go shopping or browsing in the famous art and antique district of Dania Beach where you can become further enchanted with the classic charm of this small beach town. Kids of most ages: Spend a day of family fun riding Go-Karts, playing mini golf or in the arcade at Boomers in Greater Fort Lauderdale. There’s an old roller coaster here that you can ride if you dare- it claims to be the largest in Florida! Eating: There are a lot of small, family owned places to dine. The privately owned places like these are usually the best. You won’t be disappointed at Don & Vinny’s Italian Restaurant or The Field Irish Pub, where you can enjoy live entertainment while you eat. Sleeping: The hotels maintain the cozy atmosphere here. Relax at Sleep Inn Ft Lauderdale International Airport for a reasonable price or enjoy an entire apartment at Liberty Apartment Suites.